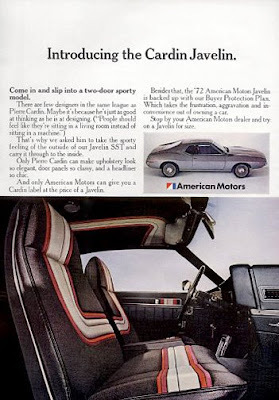 1973 AMC Javelin Pierre Cardin interior, originally uploaded by splattergraphics. 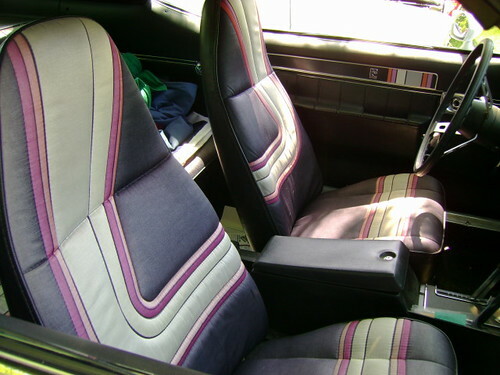 "Pierre Cardin, the world-famous French designer, has created a unique, bold interior trim theme for the 1972 Javelin SST... it will be priced at $84.95 ADP. The "Cardin" interior is expressed in Black with bold multi-color pleated stripes on the custom fabric seat upholstery (100% Nylon with Silicone finish) which is repeated on the headliner and siumlated on the door panel inserts."